Just south of the Spokane River and west of downtown Spokane, Browne’s Addition was established in the late 1800s. It was the first neighborhood home to Spokane’s elite, and anyone who takes a drive through the neighborhood knows this. Massive, elegant mansions – many of which have now been turned into apartments – line the streets. Perhaps the most notable mansions in the area are the Campbell Mansion, which is neighbors with Spokane’s Museum of Arts and Cultural, and the Patsy Clark Mansion, which is available for private events. Browne’s Addition was added to the National Register of Historic Places in 1976. Other than its historic nature, Browne’s Addition is popular with Spokane residents because it’s so accessible. There’s shopping, restaurants, parks and entertainment all within walking distance. Top restaurant goes to Italia Trattoria. In my opinion, this is the number one italian restaurant in Spokane. The owners are lovely and no matter if it’s brunch or dinner…the food has always been top notch. And top activity for the neighborhood? Well I couldn’t decide, so there’s two. First, the Northwest Museum of Arts and Culture. It’s home to multiple art collections and various traveling exhibits. Second is Elkfest. This music festival is a free, all-weekend event in early June, featuring outdoor beer gardens and food trucks. And top coffee shop goes to Cannon Coffee and Cone. Their coffee is wonderful and they feature other local businesses, like Brain Freeze Creamery ice cream and Boots Bakery pastries. Most children living in Browne’s Addition head to Roosevelt Elementary, then on to Sacajawea Middle and Lewis and Clark High School. Here are some links where you can find more information about those schools. This adorable home on the 2400 block of west 2nd was built back in 1889. 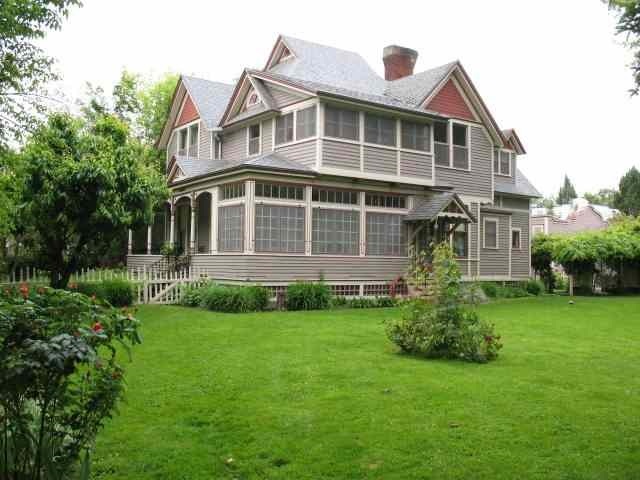 It has 4 bedrooms and 3 bathrooms, boasting 3600 square feet with original floors and fixtures throughout. If you’re considering a move into Browne’s Addition or any other amazing neighborhood in Spokane – and there’s a lot of them! – feel free to reach out to me and I’d love to help you out.